Modern Vespa : Non running Rally 180 price? Non running Rally 180 price? What is good price for a non running Rally 180 mostly complete but some minor parts missing? Engine is there, frame looks in good shape, minimal rust. As cheap as possible is always a good price. I paid £200 for my Rally 200. Ha! Love that attitude, and I share your opinion! Hopefully I can get one for similar. 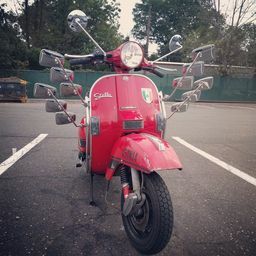 Seems from the photos of this scooter online, its possibly got the wrong/missing badges, no headlight/taillight or turn signals, no seat, no glove box, and wrong gas tank. Only right side cowl pictured, have to assume the other one might not be there. Need to get there in person to check the engine and frame stamps and evaluate the true condition of everything. Does look in good condition, and probably someone had it running with what looks like sip tubeless rims. So who knows if the engine is true original without actually getting there yet to see it. Engine number would be useful or pics. www.scooterhelp.com to check the engine numbers. Assuming no scarce parts are missing (or damaged) and it has a title I'd say anything at or below 1K would be a solid purchase. Scoot sold before I could get to it. Next time!